Members of Morton Middle School’s Kindness Committee, which is part of the National Junior Honor Society, are front row, left to right, Bailey Flohre, Lauren Randolph, Molly Lipps-Clase; second row, left to right, Taryn Butler, Olivia Follick, Raegan Elder, Zane Bedinger, Jaaron Dean; and third row, left to right, Emily Ledbetter, and Heather McBride. VANDALIA — As our society seems to become more crass and less polite by the day, students and staff at Morton Middle School are trying to reverse that trend at the school and, by extension, the Vandalia-Butler community. In its second year, Morton’s kindness initiative was the brainchild of teachers Amy Stein and Lisa Erdahl. 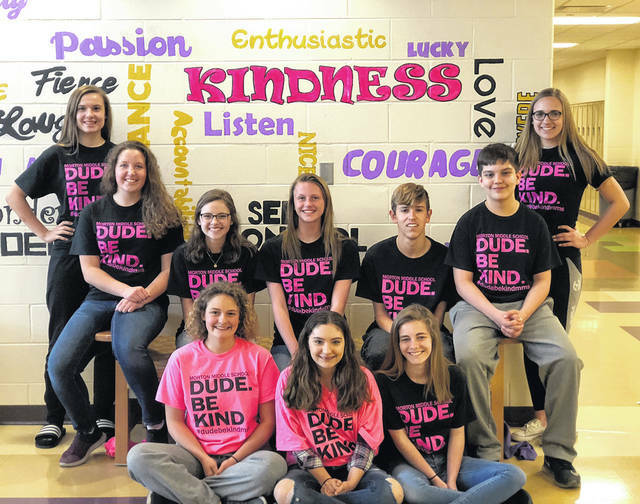 Looking for a new approach to character education, their idea of a “Dude, be kind” campaign has become part of the culture for Morton’s students in grades 6-8. A Kindness Committee was formed as a sub-committee of the NJHS where students come up with ideas to encourage and ingrain kindness. Taryn Butler, and eighth grader who heads the committee, said being kinder is not just for students at school. Each year, students pledge and sign a banner to be kind in both words and actions. In October and April, students participate in 20 days of kindness where students are given ideas and examples daily of ways they can be kind in their daily lives. Students are also encouraged to give “shout-outs” weekly to acknowledge kindness they have received from both students and teachers. Their brightly colored t-shirts are worn once a month as a reminder to always be kind. Bracelets with “Dude, be kind” are also very popular with students. https://www.vandaliadrummernews.com/wp-content/uploads/sites/19/2018/05/web1_DudeBeKind.jpegMembers of Morton Middle School’s Kindness Committee, which is part of the National Junior Honor Society, are front row, left to right, Bailey Flohre, Lauren Randolph, Molly Lipps-Clase; second row, left to right, Taryn Butler, Olivia Follick, Raegan Elder, Zane Bedinger, Jaaron Dean; and third row, left to right, Emily Ledbetter, and Heather McBride.